After 3 years of many successes may decided to quit. We'd like to thank everybody who supported us during these years. 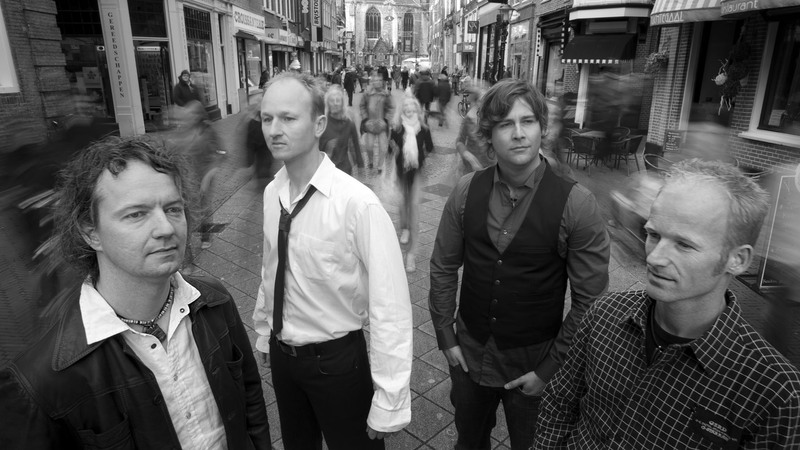 Last chance to see the band play will be at the "forever young festival" Grootebroek. If you're not having the CD "Echopark" yet, this site is the last place to order your copy! Great or Great?!! Saturday November 29th MAY plays in Ramona's, Medemblik together with their friends "Cool Zero" They did the support for "de Golden Earring" for a whole year.. just like MAY did in September. They we're already friends but this will sharpen the community! Today the production of the cd has begun. We have put a lot of work in the graphic design and the finishing of it. The cd will be presented in a luxurious digipack with booklet. Our thanks go to Niels Zwan for his direction in these obscure matters. June 20th 2008 is the day. Echopark can be bought for the first time during the cd release party at Van Rooijen in Wervershoof. It promises to be a spectacular night because for one we have contracted the great Belgian band Staircase. More later. Last April 26th we have a great night during the Battle of the Bands in Zevenbergen. To us this is the best band competition there is. Hospitality, professionality of the jury and quality of the contestants; all scored very high. Today we received the good news of being selected for the grand finale on October 17th together with 6 other ace bands.. a tip! Check the website (in Dutch). Today the definitive master flew in from the USA. For optimal result we have looked for a renowed firm en we have found one in Precision Mastering in Los Angeles (Stones, RHCP, Nirvana & Counting Crows).Wow! This really is the last push that the cd needed. O.. with a deep, deep bow to Han for his fantastic mixing work. Hey.. it’s our birthday today. Today’s the first day of our second year together. No cake & candles for now. We’re gonna celebrate it during the cd release party later on this year. The recording went really well and the premix promisses more than we hoped for. This week the songs will be mixed at the Bulletsound Studios. Our brainchild is now in the capable hands of Han Nuijten (2 Meter Sessies) and will be taught to walk. Today we start with the recording of our first full length cd. After just over a year we will be found in the Legacy Studio again. You can follow the proces of the materialization of this 10 track masterpiece on our hyves (in Dutch). We have found 2 reviews about our first cd “Open Your Eyes”. Click here to read them. 26-01-2008 And the Award goes to..
West-Friesland has chosen and many were surprised by the outcome: Beavershot has won the Westfriese Popprijs. But was this really a surprise? No doubt about it: West-Friesland is the epicentre of brutal guitarsound and point-blank musicallity. 3 out of 4 nominees take a different course and have stand out because of that. So have we. But it's harsh to see that we turned out to be second by only 1.2 procent of the votes behind no.1. But overall there's positivity. The fact that in a year and a half we have made it amongst bands which are here for at least 10 years, says it all. We have been noticed, we have been heard! West-Friesland thanks for the honour. Today it has been confirmed that we will support the greatest Dutch band ever on September 20th 2008 in Sportcentrum de Weyver, Hoogwoud. Special thanks goes to May-believer Marco van Stam of JBL-Events for bringing about this gig. Check out these live amateurshots of our gig in Paard van Troje, The Hague. A good opportunity to value our latest work. Here is Starting Today. We are nominated for the Westfriese Popprijs Award!! We are 1 of the 4 bands which are handpicked by the music industry, programmers and radiostations in West-Friesland because of positive contribution to Westfrisian popculture. On January 26th 2008 we will play together with T.IF.T, Beavershot en Scylla in Manifesto, Hoorn. After this the award will be handed out. Somewhere soon voting will start. The band with highest number of votes will win. Tonights long journey to Groningen has not been rewarding. No moviesoundtrack by May in the motion picture The Deal. And fair is fair, the remarkable band Paper Tiger is a winner that fits in just right. We did make some interesting new friends. Who knows what this will bring us? Yep! The first edition of May Presents is history. Together with Stud Muffins (The Hague) and A Silent Express (Groningen) a poster to be proud of. But not everything went smooth. After Cool Zero (Breda) cancelled their gig because of illness of the leadsinger, a day later our Jacco did not seem capable of singing either. Knowing this, very bad weather and the fact that it was St Nicholas Day for many of us, sadly resulted in a poor attendance. It was the energetic performance of A Silent Express that brightened up the day. This was followed by an extra long jummy set by Stud Muffins. And after all we were able to squeezed out a neat 9 songs too. Lost of enthousiatic reactions and a great atmosphere backstage give us a good reason for organizing May Presents part II. Because of illness Cool Zero had to cancel their gig at R17. We found an excellent replacement in "A Silent Express". The youngsters from Groningen just signed a record deal and are finalists of the Grolsch Grote Prijs van Nederland. This is a band you must have seen! We needed a new band photo for some time now. So it was on this chilly saturday morning that we could be found in our blouses in the city centre of Alkmaar. For a first impression click here. Special thanks to Ruud Mol, www.RuMoFoto.nl. Today we were pleased to hear that we are chosen to be one of the bands that will have a chance of recording the soundtrack of the new motion picture The Deal. Several bands will compeed in a band contest to win this price. December 13th Simplon Groningen. We're very busy planning new gigs for the end of this year. There are some coming up which are not confirmed yet. For now put this special one on your calendar: R17 Grootebroek December 1st 2007. A night with Stud Muffins (Den Haag) and Cool Zero (Breda). These bands have been banging on the doors nation wide lately. And we're proud that they are coming over for a super night for music lovers.. May presents! A star is born! Alex & Els are the proud new parents of their son Huub. Just like his father he is made for future glory. Just a few days after our success at the Rabo Popweekend in Schagen we can confirm a gig at the temple of pop in Alkmaar. Friday August 17 Atlantis, Alkmaar with our friends Dot. In just over the year that we've been together now, several people in the industry who like us have come by. Television programme makers, a studio owner, a radio dj, club owners, programmers, just name it. And now a manager. Today we have decided to start working together with JBL-events for bookings. If this works out for both of us, JBL will take all of the managing tasks out of our hands. The upcoming months we will be working hard on new material. Because of this you will be seeing us less on the podium. Working titels for 2 new songs are Elusive en Starting Today. We can't always have the wind in our sails. And so it is that we ended up 2nd tonight during the finals of the Popprijs Zandstock band competition. So we miss out by a hair on playing the beautiful Zandstock Festival this summer. Bratt is the rightfull winner. Last night May has won this prestigeous band competition. With up to 70 acts participating in the competition this is the jewel in the crown of our absolutely successfull first year! The price is a place in the line up of the Rabo Popweekend on Augustus 4th which is visited by some 5000 people every year! After unbelieveable hard work the CD is finally finished and how!!! In the near future the 5 song master piece can be bought through this website but first.. the presentation. This shall take place on March 24 during Keut In Rock Festival. Not much more than 100 meters away from our rehearsal studio. It couldn't be more right.